Sir Bradley Wiggins’ minute man Andy Birdsall managed to stand up to the time trial world champion for over four minutes at the City RC 10 mile event this Saturday. With a roaring tailwind on the first four miles of the course, the Tickhill Velo rider surpassed his own expectations for how long he would be able to prolong the inevitable and stayed ahead of the rainbow stripes for four minutes and 20 seconds, setting a personal best of 24-52 in the process. Birdsall’s club had run a competition on social media to promote their YESSS Tickhill Grand Prix, inviting followers on Twitter to guess how long their man would last using #ANDYvsWIGGO. “I got further than I thought, before he passed me, so I can’t complain about that,” Birdsall told Cycling Weekly after a bite of cake and a bottle of water at the finish in Newport, near Hull. The strong northwesterly wind toppled Wiggins’ hopes of breaking the competition record for 10 miles, turning from a tailwind into a gusty headwind on the final five miles and leaving Alex Dowsett’s mark of 17-20 intact. That wind also delayed the start of the event by 45 minutes after a wobbly lamppost, which had been driven into by a car on Friday night, was deemed unsafe by the Highways Agency and was removed from the roadside. 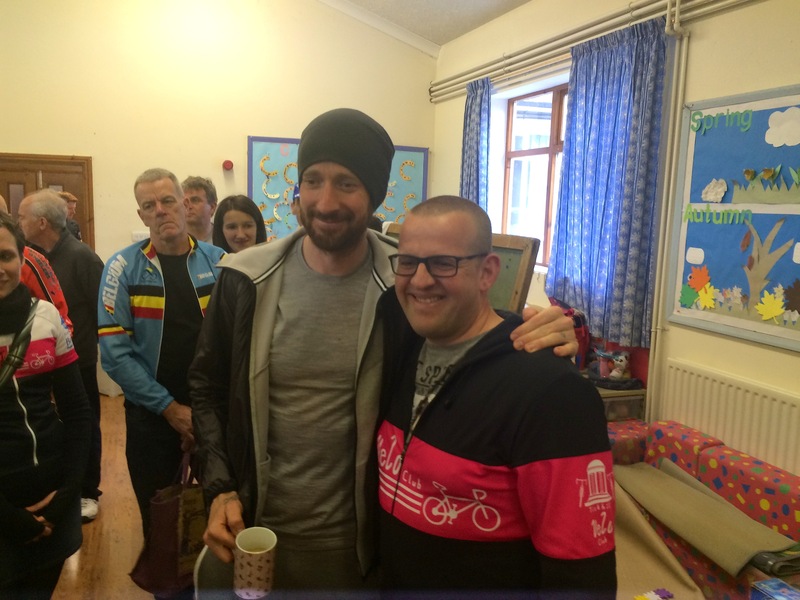 It didn’t make much of a difference for Wiggins – the wind neither died down nor increased as the afternoon wore on – but it did mean that the sheet of finishing times, the tables of cakes and the tea urn had to be moved to a sideroom at the Newport village hall to make way for a pre-booked children’s party. It also made for soaring speeds in the first section of the course, which began with a smooth downhill sliproad onto the A63 dual carriageway. Wiggins declined to sign on at the start in Newport (leaving the job to his director sportif Simon Cope while he warmed up in the empty car park of a nearby hotel) but rode off the dual carriageway after the race, chatting with a small bunch of competitors – including his seven minute man, who he overtook – before jumping into a team car, returning to the hotel for a shower and then over to the HQ to sign autographs and pose for photos. It wasn’t just about Wiggins though; Birdsall says he was well recognised by the hundreds of fans lining the lay-bys and bridges along the A63, including around 30 supporters in the bright pink kit of Tickhill Velo themselves. “I didn’t feel any pressure beforehand, even on the startline, but it was a bit of relief that when he [Wiggins] passed me so I could just carry on with my own plan to keep pedalling as fast as I could.